Chicken nuggets V cereal bars: what’s healthier? At first glance the answer to the question in the title seems pretty straightforward: chicken nuggets are obviously a lot more evil than an innocent cereal bar? Especially if you eat those super healthy, organic ones, right? Well…sometimes yes and sometimes no. I spent some time a while ago reading and listening to the excellent Michael Pollan talk about the food we eat. Pollan has lots of interesting and informative things to say about food. He comes at it from 360 degrees considering the welfare of the animal it comes from and what that animal has been fed, analyzing how it’s produced (what’s been added to it) as well as the social, economic and environmental impact our food choices have. Chicken nuggets took on a new meaning: it wasn’t just dodgy food from a dodgy corporation I chose not to eat anymore – it also became about politics, health, human rights and our planet’s resources. Though I do eat chicken nuggets nowadays. I buy the best chicken I can afford and find, cut it into strips, drag them through beaten egg and seasoned breadcrumbs in turn and shallow fry in olive oil. They are crispy and delicious. At about the same time I welcomed chicken nuggets back into my life, I also started thinking differently about what I put in my shopping basket. I discovered that just about EVERY processed food item on our supermarket shelves contains some form of high fructose-glucose corn syrup and why exactly that is so detrimental to our relationship with food. I already new that diet foods like ‘low fat’ yoghurts contained very high amounts of sugar and other distasteful ingredients (it’s gotta taste of something) but I was still under the illusion that something sold as a cereal bar by a ‘healthy’ brand would be just that: some cereal, maybe some druid fruit and chopped nuts. Possibly a little sugar, honey or maple syrup. 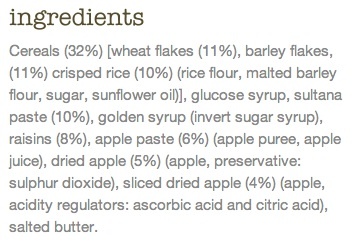 Below is a snapshot of the ingredients in the Apple & Raisin cereal bars I used to buy until I started to scrutinize the ingredients more closely. Chicken nuggets were starting to look like the ‘healthy’ option. I’m not naming the manufacturer because this isn’t about cereal bar manufacturer bashing: I like this company and some of the stuff they do is very nice. 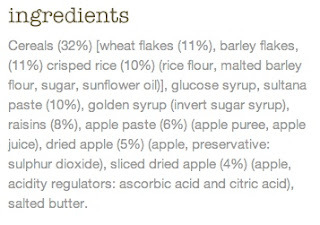 Also, I’ve seen cereal bars with lists of ingredients to make this one look positively angelic. But still. I don’t want to eat a cereal bar made with 20 odd ingredients. When I stopped buying those cereal bars, I did go on the search for one that was closer to what I expected a cereal bar to be. I found quite a few which had very few ingredients but frankly the taste wasn’t great or they cost a fortune or I had to go out of my way to a health food shop to get them. I put my Kitchen Fairy hat on and set to work finding a solution. I found a very promising recipe in one of my favourite baking books: Baking Magic , by Kate Shirazi. The recipe is for what she calls Bananas-a-go-go cookies. I’ve adapted it a little to suit my taste and it’s really delicious. Also a way perfect to use up black bananas and the rest of the ingredients are store-cupboard basics so I’ve counted this as one of my Frugal Challenge successes of the week. This quantity makes about 3 or 4 ‘cereal bar’ sized bars. Mash the bananas in a large bowl and then add all the other ingredients. Give it stir and let it rest for 20 minutes so that the oats have time to absorb the liquid and puff up a little. Line a baking tray with baking parchment and turn oven on to 180. Shape the mixture into whatever shape you like: bars, cookies, flat squares, making sure you’ve pressed it gently together with a spoon or your fingers. Cook for 20 mins or a little more if you want them crispier ( or just make them thinner). 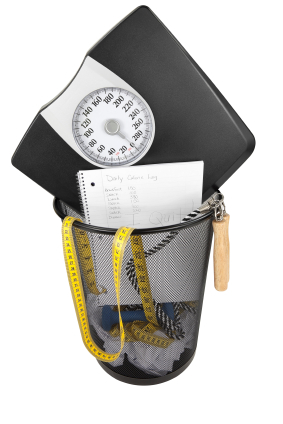 You’ll know after a few times how long you need and what the best shape is to get them how you like them. Cool on a rack and store in airtight tin. Best eaten within 2 days. Liqueur Liker? Make your own! They look lovely… do you think they would work as well with melted butter in place of the vegetable oil? Thank you. Probably would…you’ll have to test it and let me know! Oh, and Chocolate Fairy, your nuggets sound delicious… I think I’ll have a go at them! I used muesli, as that’s what I had in the house. Its mostly oats, with some seeds. I took out the candied fruit and cornflakes (fiddly, but a lot of muesli doesn’t have these), and added chopped nuts and 2 chopped dried apricots to the 80 g of muesli I used instead of 60g of oats, and they turned out great! A muesli tip – put some in a bowl with the milk, put foil over, and leave in the fridge – the oats and other cereals go all soft and taste even better. Can’t wait to try this out as I find cereal bars handy snacks when on the go, but am concerned lately about the processed ones and the ‘healthiness’ of eating these often. Was thinking of making some banana bread, but gonna try this recipe as well!